Reading is a magical skill that transports you anywhere you want to go. The younger children begin to understand the joy of reading, the better, in my opinion. Many parents have worked reading into their various baby routines, and, in my house, we read two stories before naptime and many other throughout the day. 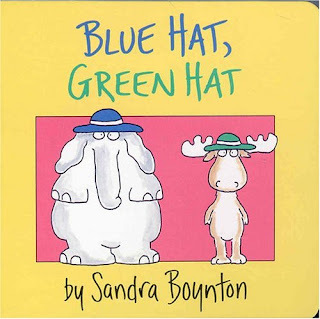 Some children's books are great in that they teach kids simple concepts and connect those concepts to others. For instance, children's books are fantastic at showing kids that an object can have a color and still be defined as that object. "Red shirt, yellow shirt, green shirt, oops!" as the Sandra Boynton book goes. Those simple words combined with the pictures teach children what a shirt is, that shirts can be different colors and still be shirts, what four different types of animals look like (elephant, bear, moose and turkey), and that a shirt can be put on wrong (if you're a turkey). But this beloved book has one fatal flaw. The objects it mentions in two dimensions quickly become objects of desire to my babies in their three-dimensional form. And sometimes those objects are not readily available or cause too much excitement pre-nap - shoes and hats, particularly. The mere mention of shoes or hats, or even passing images of them, can turn calm reading time into a frenzied game of get-the-baby-exactly-what-she-wants-right-this-instant. I combat this best I can, usually by flipping the page, but their minds are no longer in a soothed state, and pictures of ducks, water, beaches, coats, bicycles, keys, anything really, can set naptime back a good half hour. The best baby books to read before naptime are those that contain objects toddlers like, but have never had or seen. Trains are a great example for us. My babies babble in delight at the picture of a train, make the choo choo sound and happily move on as they have no idea that a train actually exists in three dimensions. Another good baby book before bedtime is a potty training book. If my toddlers get excited and want the potty, that's great. If they remain calm and don't want the potty, that's also great. Thankfully, even the books that contain tantalizing images of pots and pans and spoons and bubbles usually center around one theme - eventually the main characters go to sleep. This is a genius move on the part of children book writers, and I can never thank them enough. I am always relieved to get to the last page and see the words "good night." It makes my transition seamless, and the babies think that their going to bed is natural because that's what happened in the book. Thank you, writers of children's books for knowing children. Now if you could only find a way to write only about trains and potties. You could always writing a potty "train"ing book, LOL! And no I refuse to admit that I wrote this. I reserve all "good night" books for night time reading (or before nap reading) and all other books are regular day time reading or after nap reading. I find that after nap reading is a good transition activity for my grumpy-to-wake kids. This is why my son has a gazillion stuffed animals. So that whatever book we're reading at night, when he screams, "I want the monkey! Where's my monkey?!" we have a stuffed monkey (or cat, bear, giraffe, bunny, duck, etc) to hand him. Note: Do not send brio, Thomas, or any other brand of wood/magnet train for their birthday/christmas/festivus. You should try the book "Time for Bed". It's all cute animals getting ready to sleep.